Located a short walk inland from the beach, Sunset View Chalet is not the most luxurious of budget choices but it’s an ongoing labour of love perfect for nature lovers and travellers happy to go no-frills. Surrounded by lush foliage, the 16 small chalets include a bed with a small desk and chair, ensuite cold-water shower and cosy garden view verandas. Free WiFi is also available in their small reception area. Furnishings are on the rustic side, but the tiled floors and bathrooms are spotless. 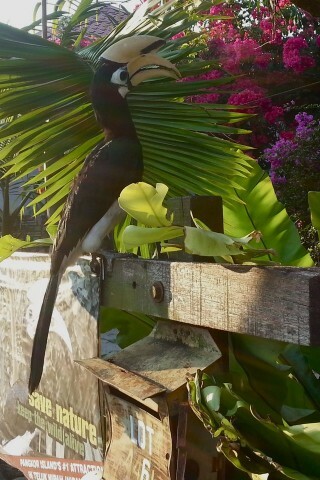 Sunset View’s claim to fame includes a daily sunset hornbill feeding, when chalet owner Noordin takes great pride in the beauty of his birds as well as his skills as a smartphone cinematographer. He’s been feeding the local hornbill population for more than 14 years and is happy to video visitors while they hand-feed the wild birds.